For the first time in three years since 2006, the F1 Japan Grand Prix was held at the holy ground of motor sports, "Suzuka." 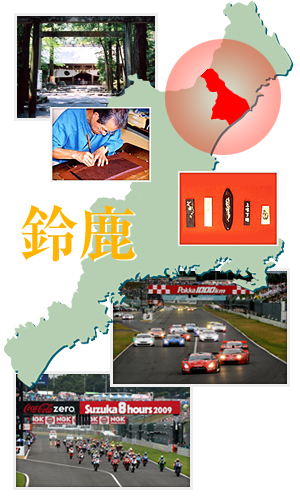 During the time of the Suzuka F1 Japan Grand Prix, thirty-two organizations affiliated with Japan, Mie Prefecture, four surrounding cities and one town (Tsu, Yokkaichi, Kuwana, Kameyama, Komono), tourism, economics and transportation established the Suzuka F1 Japan Grand Prix Regional Revitalization Association. We are striving to improve our transportation services for easy access so that everyone who comes to Suzuka is comfortable, and can have great memories watching the race. Thursday, October 7th - Monday, October 11th (Holiday), which includes the day of the final on Sunday, October 10th has been designated as "F1 Week" this year. We hope you look forward to this event as the Suzuka Circuit, local towns, and regions will unite to carry out the biggest festival in Japan. Beginning with the Ise Bay (伊勢湾, ise-wan) in the east, the rich with nature Suzuka Mountains (鈴鹿山脈, suzuka-sanmyaku) in the west, the Tsubakiokami-yashiro Shrine (椿大神社, tsubakiokami-yashirojinja), the Ishiyakushi-juku (石薬師宿) and Shono-juku (庄野宿) stations of the East Sea Road (東海道, tokkaido), traditional arts, Ise Katagami stencil, Suzuka-zumi ink, and many other things, Suzuka is a city that was raised in traditional culture and history. As a town that began with a population of approximately 52,000 people, this city attracted many enterprises, such as the automobile industry. As a result, it has developed into the leading industrial city within the Ise Bay area. Also, this is an abundant and vast land for the agricultural industry. Presently, tea, trees, flowers, and wet-land rice are actively produced, which has developed the agricultural and industrial industries in Suzuka to label it as a "green industrial city." In recent years, the city has been making a lot of effort towards the progression of international exchange and civic culture, helping it to develop even further from many different aspects. Currently, the city has an overall surface area of 194.67km2 and a population of approximately 20,000. The city continues to develop harmoniously in the areas of industry, economics, culture and civic life. Also, the city is known as an international city of tourism. In addition, Suzuka was the first city in Japan to be declared, "The City of Motorsports" in December of 2004, and the city aides in the promotion of municipal level motorsports. The dates of “Suzuka Circuit 50th Year Anniversary Fan Appreciation Day” and “F1 Race 2012 Organizers Kick-off Event” are set. FIA Formula 1 World Championship Japanese Grand Prix Suzuka 2012 is confirmed.